Embutido is one of the dishes that I frequently cooked when R and I were just starting our family. Most home cooks say that this is best for Filipino parties or celebrations. I agree! My mama always has this in her table for Noche Buena or Media Noche. In my opinion, though, this can also be categorized under freezer or make-ahead meals. Want to try making it, too? Here's the recipe! 1. 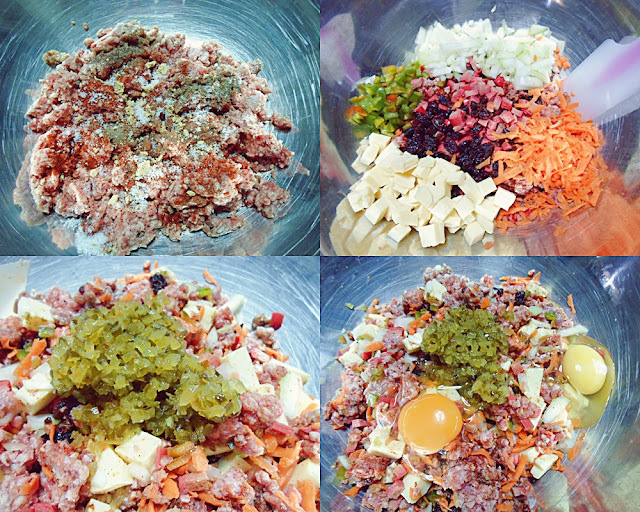 In a large bowl, mix the ground pork with salt, ground black pepper, paprika and garlic powder. Mix it really well. Use your hands. Just make sure it's clean! I didn't put measurement for these ingredients since it's best that you put your desired amount according to your liking. 2. Add the onion, carrots, cheese, bell pepper, hotdog and pickle relish. Mix it with your hands again until well incorporated. You can put catsup if you wish. You may have to put more bread crumbs. So if you want it purer (no extenders as much as possible), forget that I mentioned the catsup. 3. Put the eggs and mix again. 4. Add the bread crumbs. I used days old bread and manually crumbled it into tiny pieces. The bread is used to absorb the liquid from the eggs and other ingredients. It also serves as binder. 5. Cut 10 by 12 inches aluminum foil. 6. The shiny side face up, scoop 1/2 cup of the mixture and place it on the foil. Form it as shown in the photo because I don't know how to describe it, haha. Wrap it like you do with lumpiang shanghai except that you won't use egg wash or water to seal the ends, obviously. 7. Steam for 1 hour. 8. Once cooked, let it rest for a few minutes before opening and slicing. 9. Serve with rice and some greens. Dip with catsup and mustard if you like! Enjoy! My version looks rustic because I didn't want to use a lot of eggs and bread crumbs. But maybe I'll try that next time to achieve a more real meatloaf-looking embutido. Tag me on your post if you have tried this recipe. Would love to see how you do yours! For more of my recipes, click here. Hi Ms. D ilan piraso nagagawa dito sa mixture nato? Thanks D! God Bless youas always..